Dakota Kemp, a friend to this fine blog, has released his new book, “The Omens of a Crow” on Amazon. I’m not sure what it is about but there is an ominous looking dude in a cloak on the cover and the description says he is about to bring something scary to a village. That’s my guess. I suppose you’ll have to check the book out to find out what it actually is. Let me know if it is chips without dip. I do this every year but I’ll ask again. Who are your favorite fathers in literature? MTV is advertising a TV series called The Shannara Chronicles based on the book series by Terry Brooks. Just seemed like cool book related nerd news to share, so there you go, 3.5 readers. …is going to attend Hogwart’s in a new spinoff of the Harry Potter series. What say you, 3.5? That’s more than just a throwaway quote, isn’t it? Fear of ending up alone. Fear of losing your love to another. Fear of making a mistake, especially a long lasting mistake. These are fears that build up inside of us and yet, we need to try to find away to ignore them lest we become so paralyzed with fear that we are no longer able to live life. But enough of the serious talk…beer! Woo hoo! An honest to God book review on bookshelfbattle.com! It’s about time! Threeps are now walking around on my bookshelf. They can hold their own in the never-ending battle. 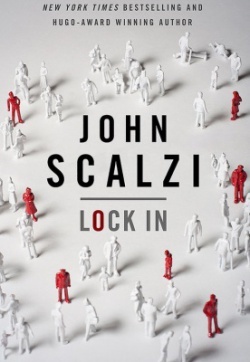 Without a doubt, John Scalzi’s Lock-In was the best book I read in 2014. Unfortunately I waited until March of 2015 to review it, but better late than never. If you’re planning to read it yourself, you might want to click off of this review. I’ll try my best to avoid them, but some spoilers may emerge. First off, the premise is unique and original. In the near future, a virus ravages the world and inflicts one percent of the population with Haden’s Syndrome. This condition causes people to “lock-in” to their bodies. Their minds work, they understand what’s happening around them, but they can’t speak or move. Their minds are trapped in paralyzed bodies. These individuals come to be known as “Hadens.” Technology grows and expands to help them. A virtual community is created allowing them to communicate with one another in a simulated world. Meanwhile, Hadens also have the ability to control robots known as “threeps” (aptly named as an homage to C-3P0). Hadens stay at home and send threeps out into the world on their behalf. The technology is so advanced that Hadens are able to hold down jobs with the assistance of their threeps. Add to the mix integrators – humans whose minds can be “shared” with a Haden, thus giving the Haden the experience of what it feels like to have a functional human body. The protagonist is Chris Shane – a Haden FBI agent whose threeps take a beating from the bad guys throughout the novel. With the help of his partner, Leslie Vann, a former integrator, Shane is tasked with solving a murder case that intersects with the politics and intrigue behind the Haden world. I am a big Scalzi fan. I enjoy his ability to blend subtle humor into serious science fiction. The premise makes for some interesting scenes. For example, at one point, Shane uses his threep to foil an assassin trying to kill Shane’s defenseless body. The book also gives rise to a discussion of virtual worlds and technology assisted realities. Could tech ever grow to the point where the paralyzed are able to experience the world virtually? What would be the ramifications? I enjoyed it and highly recommend it. To Book or Not to Book? …or to keep up with said challenge now that you’ve made it. Does it ever feel that way sometimes? When the F#%K Should Your Characters Swear? And now, our latest installment – Ann and John and the Search for More F$*ing money. “I’ve had enough of your goddamn cheating, John!” Ann said as she drew her gun and pointed it at him. “Ann! No! What the f$%k are you doing? !” John asked. Ann fired. The bullet ripped through John’s flesh. I don’t like gratuitous swearing. I like to use it sparingly, avoiding it if at all possible. Whether it is for humorous or dramatic effect, I only like to use it when the situation absolutely calls for it. It’s not that I’m some kind of prissy teetotaler. I don’t clutch my pearls, pop my monocle, and shout, “Oh I declare, I positively have the vapors!” whenever I hear naughty language. Unless it is somehow central to the plot, or somehow works well with the story, I just fear that too many swears will alienate a reader. “I’ve had enough of your gosh darn cheating, John!” Ann said as she drew her gun and pointed it at him. “Ann! No! What the fiddlesticks are you doing? !” John asked. “I’ve had enough of your cheating, John!” Ann said as she drew her gun and pointed it at him. “Ann! No! What are you doing? !” John asked. Well, let me get to the whole point of why I seek your input. As previously discussed, I’m working on a sci-fi novel. It takes place in a gritty world, where life isn’t easy for my characters, and bad things happen. It has aliens, robots, spaceships, monsters – or in other words, the odds are younger people will like it more than older folks. Although, maybe not. I feel like I’ll still love Sci-Fi when I’m eighty years old. The more sci-fi was around when you were a kid, the more you’ll like it as an adult. As an author, I find swear words to be particularly vexing. Don’t use a swear and you might be selling out, overuse swears and you’ll push potential readers away. And the second you drop a swear word into your book you move from something that can be enjoyed by all to something that can only be enjoyed by few. Well readers, what the f%&k do you think?